Looking for a good example MFJ-828 watt / SWR wattmeter please. Must be in good condition and full working order. Please E Mail or phone 01487 840303. Must be local to Cambridgshire or able to deliver. i also have a Spektrum DX7s also lots of drone/quadcopter parts, etc: Naza flight controllers/Motors/13" Carbon fiber props/batterys/chargers & more, if interested in anything listed please Mail me. This is in an excellent condition and complete with the YSK-7800 Separation Kit (Unused) and fully boxed with original manual & DTFM Microphone MH-48 (unused as I used an Adonis desk mic). The Adonis D-6MY lead is included in the sale. Deduct £10 from price if not required. Only used indoors in a pet & smoke free home and the reason for selling is I have replaced it with an Alinco dual band radio which does true Dual Watch & crossband. Only £125 inc economy delivery. I am selling my Racal RA 1772 which I have had for a couple of years. It has had little use here. I am no 'RA 1772 Expert' but the receiver is working fine and can be seen and tested here at my QTH near West Malling, Kent. Owing to its size and weight it will of course have to be 'collect only'. Text/call: 07973 260022 or email: peter AT barville DOT net. My thanks to Richard G3CWI for the use of this site. Looking for a user manual for a Yaesu FT817 and a TCXO-9 22.625MHZ, if anyone has one. I am selling my KX3 which I can no longer justify keeping because I've not operated /P with it, and know I will not in the future. Included with the KX3 are the KXAT3 (Internal ATU), KXBC3 (Battery Charger and real time clock), KXPD3 (Paddle) and MH3 (Mic). There is also a "Nifty Stand" (very handy for operation on a bench or desk) and a soft case (one recommended by Wayne, which certainly provides good protection for the rig). The usual leads are provided. The combined price for everything above when bought new is around £1800. You will see from the pictures that it is all in 'as new' condition and I am therefore asking £1250 plus carriage. Or you are welcome to view and collect from near West Malling, Kent. Please call/text: 07973 260022 or email: peter AT barville DOT net. 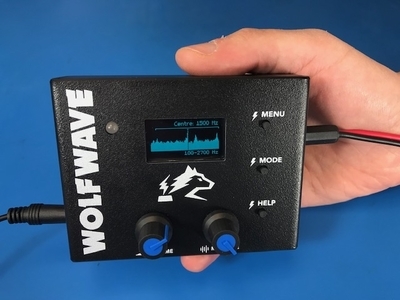 We will have our new WOLFWAVE product on display at Blackpool/Norbreck this weekend. Drop by for a demo. ICOM HM-36 FIST MIC brand new and boxed. YAESU MH-31B8 FIST MIC brand new and boxed. YAESU MH-48 DTMF FIST MIC as new. All £35 each posted. HAMEG DIGITAL STORAGE SCOPE HM-205 2. Dual channel, 20 MHz. Complete with original comprehensive manual, switched 10X probes and strong leather carry case. £30 collect only. Have photos of most of this gear if required. All items are plus carriage unless stated otherwise. Can meet up within reason. Harry. G4FEQ. Email g4feq.harry@btinternet.com. QTH - Castleford in West Yorks.